Is there an English style? What we see, in our towns and cities, is women in leggings and baggy jumpers and men in shapeless jackets and jeans. What we imagine is pinstripes and bowlers, tweed skirts and cosy woolies, Wellington boots and a Barbour. We don’t grow cotton or linen in the UK, and its too cold for silk worms, but we have 23m sheep. 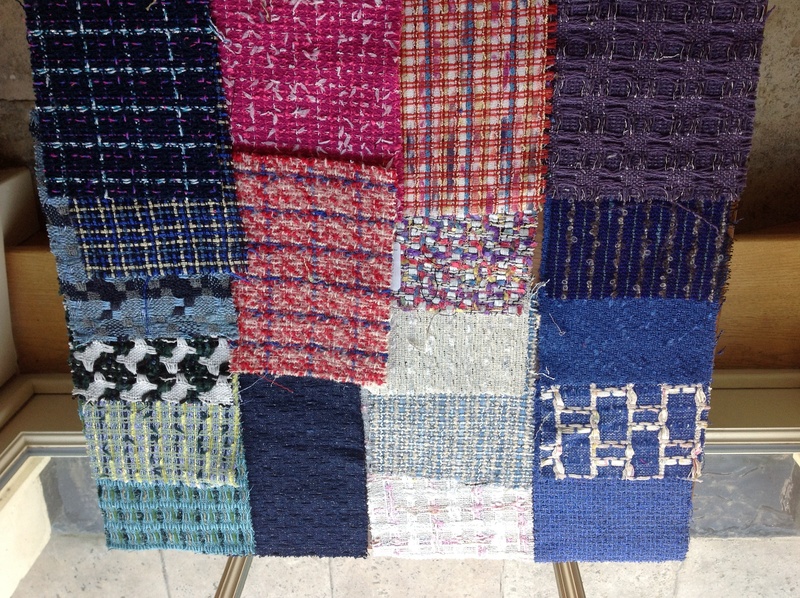 Our primary fabric is wool, despite a significant and varied textile industry. 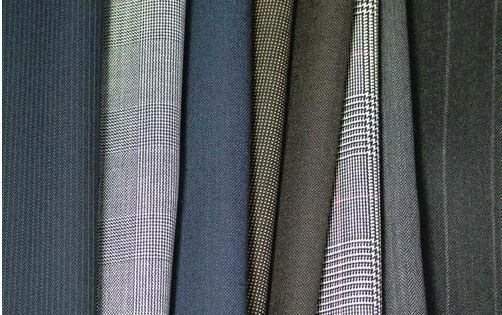 Yorkshire is the county (and Huddersfield in particular) which produced the foremost fabric for men’s suiting for a least a couple of centuries. They use 2-ply yarns in the warp and weft (which makes the cloth strong) and are finished with the English “pressed finish” which produces a very flat, “hard” finish, adding to the durability of the cloth. The Saville Row suit is a particular style and fit and one which is quite different to both European and American styles. At its most formal the English suit includes a waist coat, a top hat, and tails. In addition England is famous for its tweeds. These are the sporty version of wool, woven with a twisted yarn, often with a heathery look. 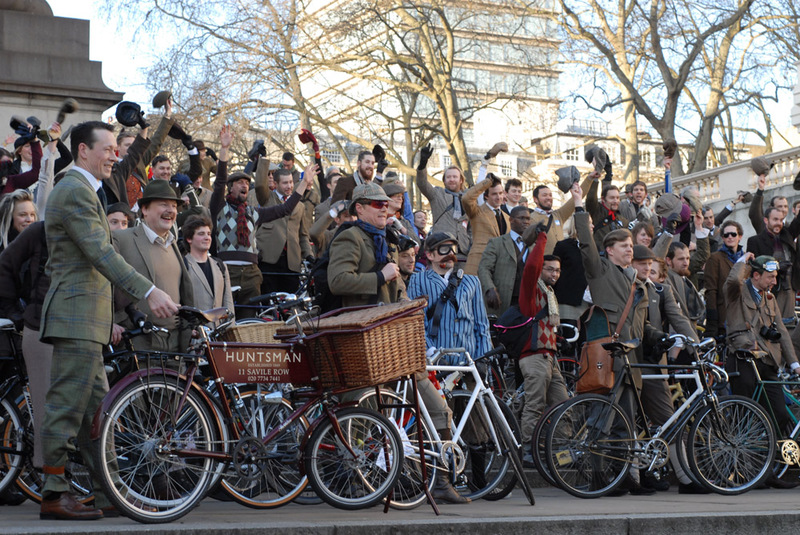 It is great to see this beautiful fabric celebrated with the annual Tweed Run (on bicycles) through the streets of London. The flat cap, often worn by country dwellers of all classes, is often made in tweed. For keen dressmakers there is always Linton Tweeds, which are famous for being used by Coco Chanel. If bought online these are good value, and there are many wonderful colourways and effects. And then there is knitting wool, and the long tradition of English women knitting. For their men. For their babies. And for themselves. The twin set and pearls look is seen as an upper crust English look. I love a nice cashmere twin set, and the kind of look worn by Miss Moneypenny in the James Bond films. 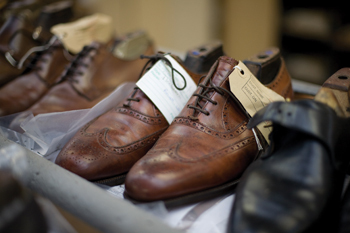 Another very English component is the leather Brogue shoe, made in Northampton. Suitable for men and women – the punching which allowed the water to escape originally as men plodded across boggy landscapes. I am from Lancashire and used to wear clogs in celebration of my roots. These were originally worn by men and women in the factories to keep their feet out of the water. Mine were red, and laced up and I felt invincible walking along in them. 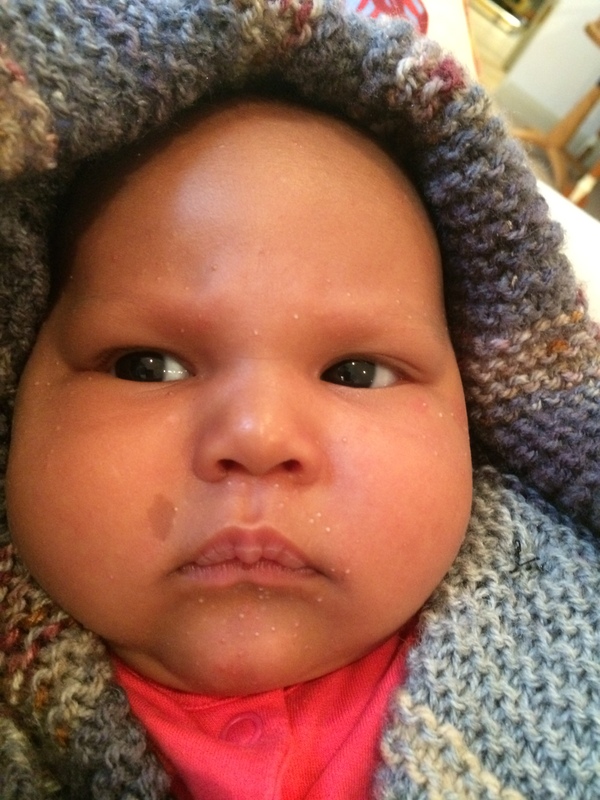 The noise they make on the pavement give out a “don’t mess with me” message – and I felt they kept me safe. 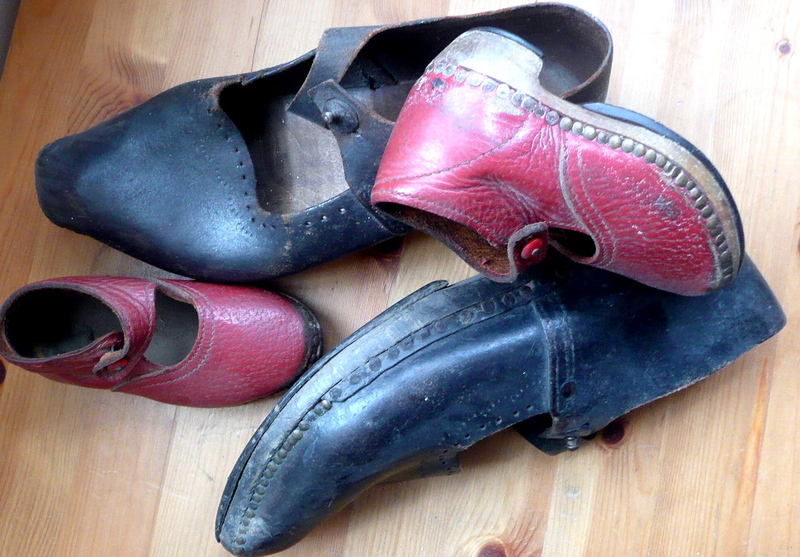 There is a charming article on clogs by Gitika Partington, who has kindly supplied the photograph. Also the English are known for their sheepskin coats, riding boots, their Pittard leather gloves from Yeovil, and high quality handbags. Do you like English style? Do you ever adopt it? That was a thought provoking post! I wouldn’t aim for a very traditional English style myself because to me it projects things that are not me: public school, upper class, fly fisherman, gardener, dog owner. There’s always a dog or a pair of secateurs in any fashion story about traditional English style. Like any look I think it only works if you own it. Funnily enough one person I know who dresses in a very English style and looks great is actually Iranian. I don’t know if he has a dog! Because I came here in the 80s, after Yugoslavia and Africa, the English look was Doc Martens, the punk/post punk look and the wonderful freedom of being able to wear anything. So liberating when coming from a place and time when women and girls are expected to look “respectable”. The magazines I bought like Just Seventeen had features on how to make your own stuff, bleach patterns into denim tye dye stuff. This was totally novel and exciting to me. Nowadays, my generation looks great in Boden, Jigsaw and Hobbs (which like to market themselves as English) but this is only an option for the well-heeled. The rest I think are too knackered with real life and just buy whatever Next/Fat Face/H&M is selling. Some of us foreigners are perplexed by the “orange faces” of young English women but once again this is might be a thing peculiar to class and I think it’s on the wane, thankfully. twin sets … to me, reads “mother” and sometimes that’s just what I want to say ! I do have wellington boots……..they are very functional. Good post! I do have dogs, wear wellies and have been wearing twinsets a lot recently but somehow even after being in the UK 28 years I still get spotted as an American. The young English who dress interestingly manage an eclectic eccentric look I haven’t seen done as well anywhere else. Lol, when I try something similar I just feel I’ve stepped over eccentric and am dabbling with mad. So it’s back to twinsets sometimes with tweed pencil skirts , more often with baggy cuffed levis and DocMartins! I like traditional English wools, knitting yarns and brogues! I like them because they are high quality. In Italy, by the way, they refer to someone who wears these things as English and it is a compliment. It generally refers to someone who wears this clothing, is elegant without being showy, and whose style is a bit vintage. Gianni has a friend he refers to in this way. There is also an “Old England Store” in Fllorence where Italians buy quality pullovers, Liberty fabric, etc. Gosh this is insightful Anne. I too dislike the Preppy look which I agree takes all the worst aspects of Englishness and celebrates rather than understands them. Tartan – hey put it on the wing back chair in the snug, so I can drink a Scotch in it. Er, is Scotch not british? English style, pressed, without the patina. I actually like it that Prince Charles has patched suits and that my husband’s brogues go back for resoling. Barbour repair too. English style never tries too hard, celebrates vintage, and I personally don’t see it as upper class. The liveliness of English street style (and our best designers) is due to its rebellious working class origins. Did I get it wrong again?